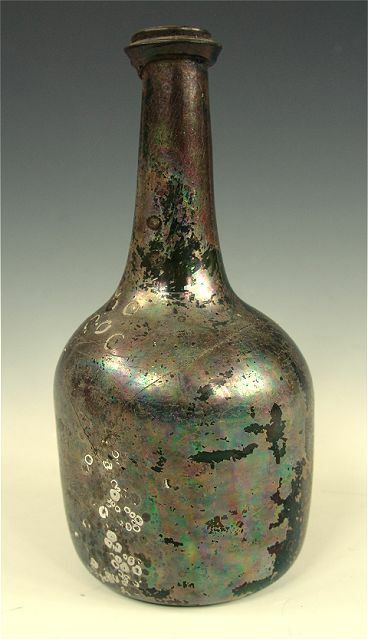 Glass bottle from the East Indiaman Gotheborg. The cork or wooden plug is still inside the bottle suggesting that the method of opening a bottle at this time was to either push the plug into the bottle or, that the bottle was still full at the time of the foundering and that the water pressure somehow has pushed the plug inside the bottle. Acquired from descendants of James Keiller, salvaged from the Gotheborg in 1906-07. Photo: Jan-Erik Nilsson.. However much water you had outside of the hull. it did not do for drinking and hardly for hygiene due to its salt content. For drinking the crew were most of the time depending on supplied that needed to be brought on board at departure and stored onboard for all needs that could arise until the supply could be renewed. Besides the crew, also the ships cook's 'floating barnyard' needed water. Next to water, a modestly strong 'ship's beer' was the most common drink onboard. Around 40,000 liters of ship's beer was no uncommon quantity. Besides this a considerable quantity of 'double beer' was kept onboard together with wine, sherry, Madeira and arrack for, as we might assume, the more well-to-do officers. During the 18th century, scurvy was a common illness in Europe, not only something that beset sailors. Food was not varied and was lacking vitamins. The trips to China also as rule started in the winter or early spring so already before they left the crew had for several months been without fresh fruit and vegetables, lacking crucial vitamins and minerals even before they have left for sea. Ever since the 17th century, they had known that herbs and citrus fruits helped prevent scurvy, the feared illness that took more lives in the navy than wars themselves. We also know that the unbalanced diet and food supply created a craving for sugar. It is not impossible that we can see the punch served onboard was also a way of making the sailors drink the healthy lemon juice by mixing it with the more popular alcohol and sugar. From the mid 18th century we have a note from the diary of Per Osbeck where he recorded the recipe of 'punch' taken from the ship Prins Carl in 1751. "The punch was cooked onboard in a huge cauldron for the crew. It was served heated by large glowing iron balls that were thrown into it. Punch was also a daily drink on the ship for those who could afford it. During the stay in China, it was drunk onboard together with meals instead of wine, which the company gave the First Table." During this trip in 1755, only 5 men died out of scurvy, a proof as good as any that the medical considerations was well under control"
"Here upon are added Muscat"
One might think though that considering the generous quantities of alcohol that were available onboard it is remarkable that these huge and bulky ships were not put aground more often than they were.